When mature, standard violets will grow to 10-12" in diameter as houseplants, much larger when grown for exhibition. Repot young plants into 4" pot at first bloom. Unless grown for show, a 4 to 5" pot will be sufficient for most varieties. Repot using fresh soil every 6 months. 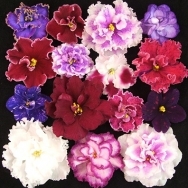 Descriptions of varieties are those of the hybridizer or of the AVSA registrar. AVSA registration numbers follow description. Photos shown are representative of what plant can look like when properly grown--most are in 4" pots or larger. We cannot ship them at this size! Plants shipped in 2 1/2" pots. Click on links below to view complete listings. Special offers at page bottom.